My nephew turned 2 today, so I made him this card. I really like this number stamp from Bring on the Cake, and I especially like to emboss it before coloring in the numbers. The card base is Riding Hood Red, layered with Nursery Suite DSP. 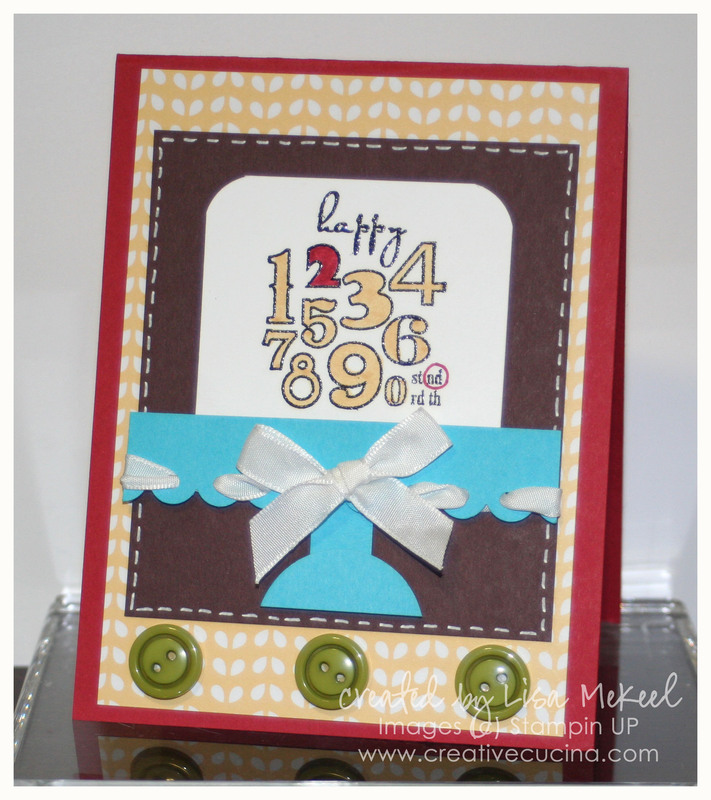 I stamped the numbers onto whisper white and then heat embossed with Black Embossing Powder. I colored in the numbers with So Saffron Marker and the number 2 with Riding Hood Red Marker. Then, I used the Corner Rounder Punch on the top corners to make it look like a cake. The “cake stand” is a strip of Tempting Turquoise punched with the Scallop Edge Border Punch. I used the cropadile to add holes to each scallop and then threaded White Taffeta Ribbon through the holes. I used chocolate chip card stock behind the cake to frame it. 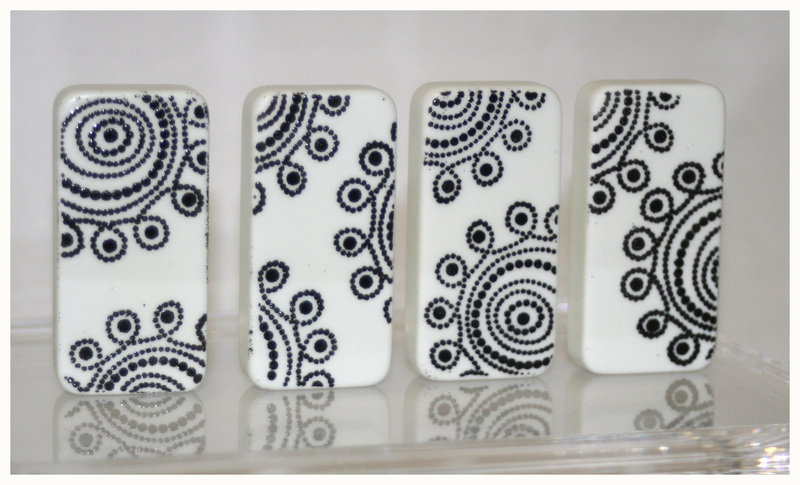 White Gel Pen around the edges makes it pop and coordinates with the white details in the DSP. 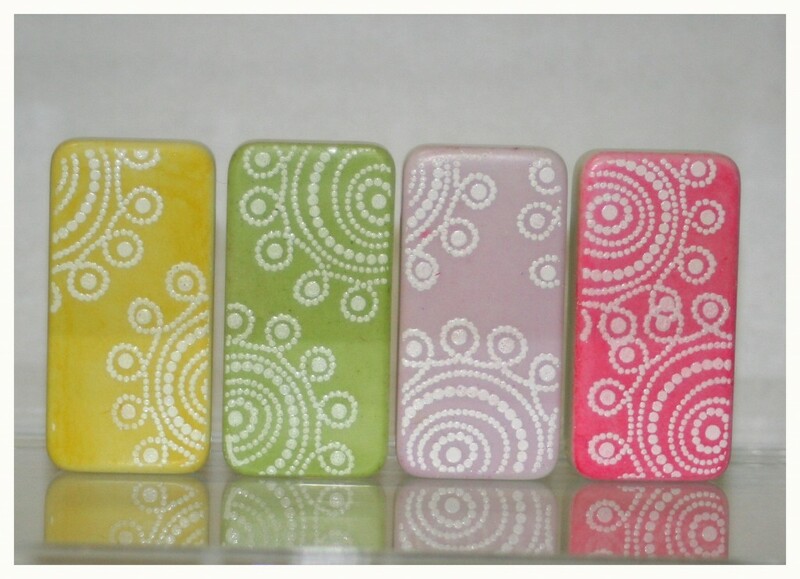 At the bottom, I added 3 old olive buttons from the Designer Buttons Brights Collection. 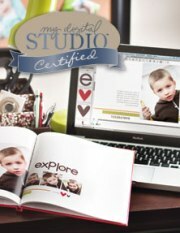 I LOVE the Bring on the Cake stamp set and there are so many images that look great embossed. 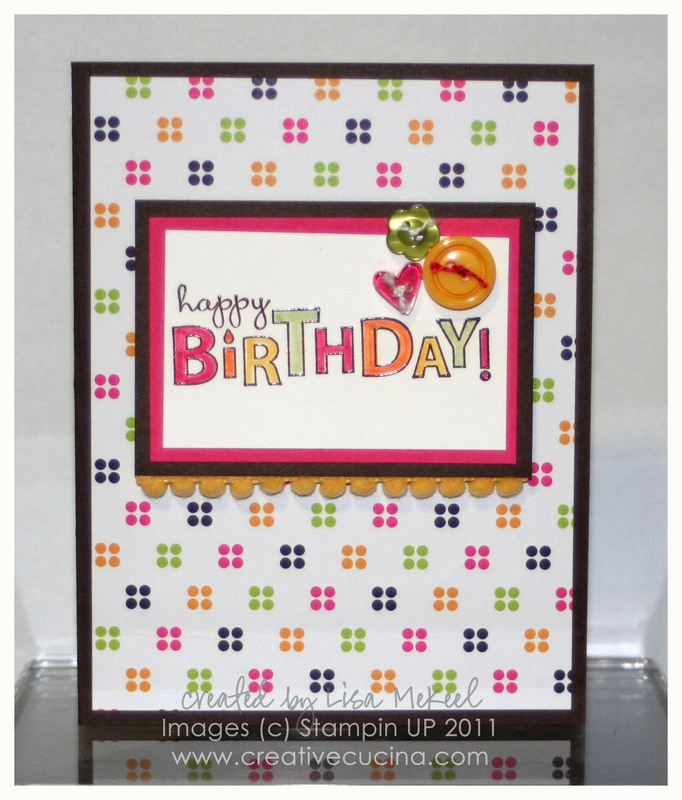 Here, I used the “Happy Birthday” stamp, with Chocolate Chip Craft ink and heat embossed with Clear Embossing Powder. Then, I colored in the letters using Melon Mambo, Daffodil Delight, Certainly Celery, and Pumpkin Pie Markers. The buttons play off the paper and ink colors: Daffodil Delight and Old Olive from the Designer Buttons Brights Collection and a clear heart from Bitty Buttons. I cut out a Melon Mambo heart and attached it to the back of the clear button to make it look pink. All the buttons are threaded with white string. I colored one of the strings with Melon Mambo Marker to give a pop of color. Tiny Glue Dots secure the buttons to the card stock. For the card base, I used Early Espresso card stock and American Crafts Patterned paper. The Daffodil Delight Pom Pom Trim was attached along the lower edge of Early Espresso card stock with Tombow Mono Multi Glue. Just run a bead of glue, lay the pom pom trim down and press lightly until it sticks. 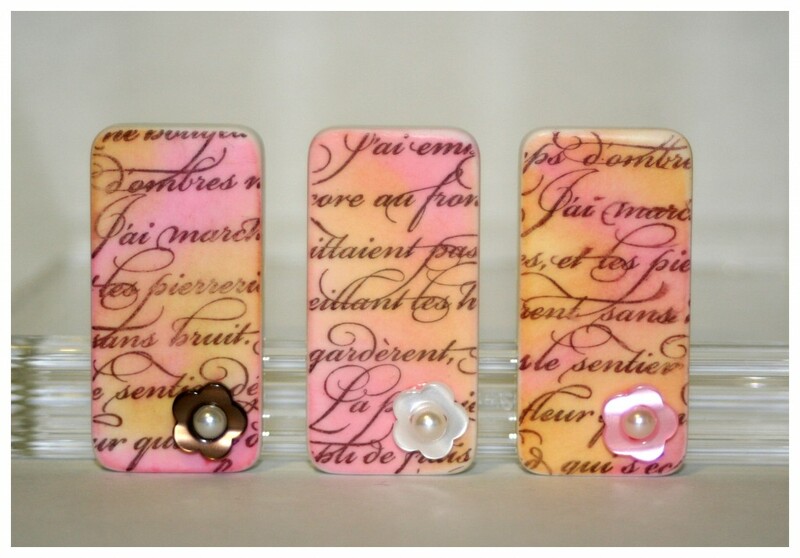 That layer is attached to the base with Stampin Dimensionals. Inside, I used 2 more sentiments from Bring on the Cake, stamped in Early Espresso ink and colored in with Markers. I used some of the patterned paper and Melon Mambo card stock inside to match the front.